After the major rain storm we had, walking around the lakes has become much easier but now we have a different issue at hand after the freeze up that followed. The lakes now have a 2 to 8 inch “crust” of ice with a good layer of slush anywhere from 4-12 inches deep on top of the base layer of ice. Vehicle traffic is not recommended at all at this point. I would even avoid running UTV’s as well. Four wheelers and snowmobiles are the way to travel. If you do get out on the ice, fishing is really stating to pick up. 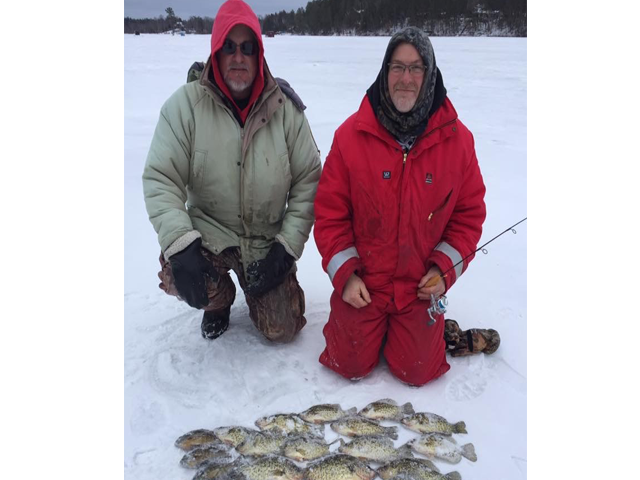 Crappies and bluegills have nearly completed their migration to shallow late ice spots with the added oxygen into the lakes. They are aggressive and can be taken several ways. Now is the time to start increasing the size of your lures as well. During the daylight periods, most of the fish we have been catching has been on plastics in a horizontal presentation but during the late evening into dark, crappie minnows on a dead stick have been producing more fish than anything. Tullibees are very schooled up right now so it may take a little work to find the pods of fish but once you do, it can be magical. Flashy metal spoons with a dropper tipped with several red spikes was our best bet but we also got some fish dead sticking glow red jigs tipped with waxies. Burbot are still on the chew several are actually being taken during daylight hours. Load up your lure with several fatheads and pound the bottom. As we continue on this spring, watch the shorelines. With all the snow we are going to have some serious runoff and our shorelines may go quickly despite the fact we have lots of ice. Be safe!